Objective: Given two string sequences write an algorithm to find, find the length of longest substring present in both of them. What is Longest Common Substring: A longest substring is a sequence that appears in the same order and necessarily contiguous in both the strings. Output: Length of Longest Common Substring: 8 ("tutorial"). Check all the substrings from first string with second string anxd keep track of the maximum. Time Complexity: O(n2*m), O(n2) for the substring and O(m) for check all the substrings with second string. Earlier we have seen how to find “Longest Common Subsequence” in two given strings. Approach in this problem will be quite similar to that. we will solve this problem in bottom-up manner. 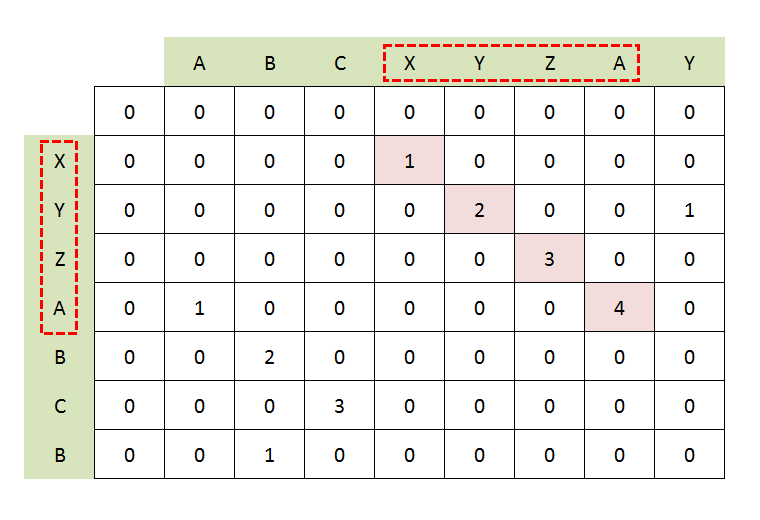 Create a matrix of size of m*n and store the solutions of substrings to use them later. Base Cases: If any of the string is null then LCS will be 0. Case 2: both characters are not same. At the end, traverse the matrix and find the maximum element in it, This will the length of Longest Common Substring. 258 queries in 0.148 seconds.